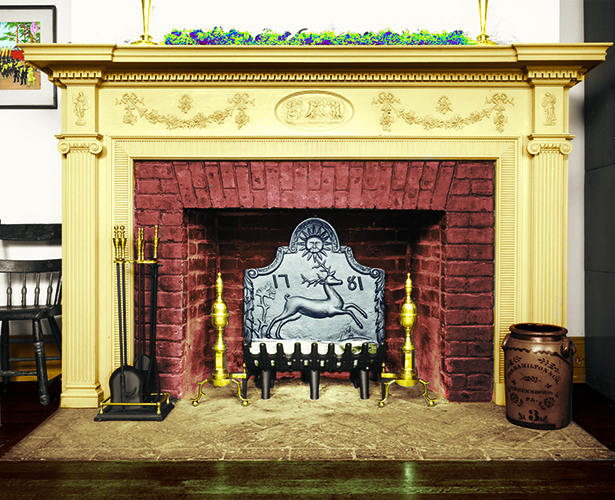 In earlier times, the well-appointed fireplace was never considered complete unless it included a cast iron fireback. Today, the fireback’s usefulness and charm have been rediscovered and they are again at the center of the hearth and home. A good cast iron fireback can improve the heating efficiency of a fireplace by up to 50%. Positioned against the back wall of a fireplace, a fireback protects the masonry of the back wall and radiates the heat of the fire forward. 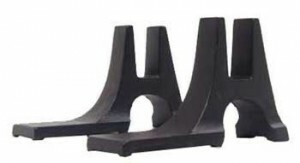 Cast iron firebacks, usually about 5/8″ thick, store heat while the fireplace is burning and radiate it back into the room even after the fire goes out. Stainless steel firebacks typically have a matte finish or a highly polished finish. 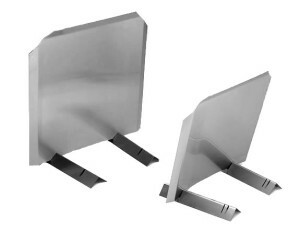 These stainless steel firebacks with either finish work by reflecting heat into the room. Stainless steel ones do not store as much heat as the cast iron ones. 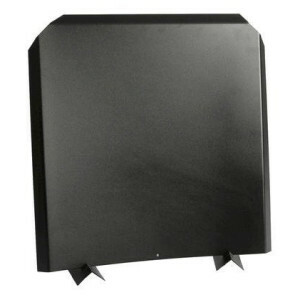 Black stainless steel firebacks, although made of stainless steel, have a heat-resistant, black powder coat finish. They shield the back wall of the fireplace from about one-third of the heat your fire creates, protecting the masonry from decay. Although some people like the looks of them better than the unpainted stainless steel firebacks, they will reflect less heat. 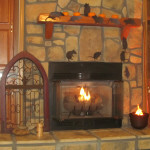 By sending light and heat out into the room, a fireback is a noticeable improvement to the hearth. A cast iron fireback is still the best way to protect a fire box’s back wall from decay. Despite advances in technology, the harsh rays of the fire render even modern refractory material vulnerable to damage and the likelihood of expensive repairs. A fireback will effectively prevent any damage to the back wall. Early fireplace firebacks (15th Century) were made in sand forms with decorations like coats of arms, religious themes, mythological subjects, and foods. Joan of Arc’s home in Domremy had one with a cross and fleur de lis pattern. The mirror-polished stainless steel firebacks are often selected as least as much for their visual properties as for their heating properties. Serving as a mirror, they double the firelight. 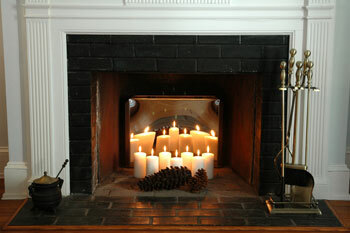 When used with candles in fireplace candelabra, they make six candles have the visual impact of a dozen! 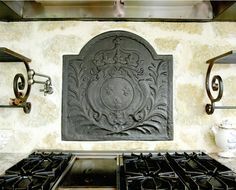 Increasingly, cast iron firebacks are used on the wall behind a range as a backspash. 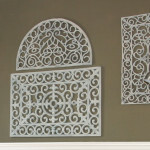 They are also used in other decorative ways, in parts of a home other than the fireplace. See how to wall mount a fireback. They secure the fireback in position. If you use firebacks where there is frequent vibration or there is exposure to earthquakes, we highly recommended the use of stands. Vibrations may be an issue, for example, in homes near railroad tracks, subways or highways. They position the fireback at grate and firewood level instead of at the level of the firebox floor. Thus positioned, they radiate or reflect more heat into the room. Also, more of the fireback is visible. 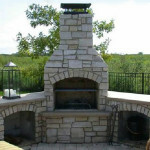 They hold the fireback at the best angle for your fireplace. 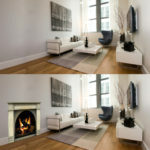 If the back wall of your fireplace angles toward the room, you will definitely want to use stands. 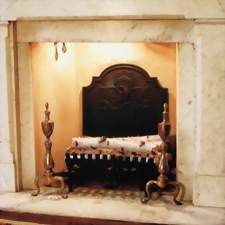 Cast iron fireplace firebacks need little care as long as they are not exposed to moisture. If you ever feel the need to freshen them up, use a black spray paint specifically designed to withstand high temperatures. The cleaning of a stainless steel fireback is as convenient as it is easy. Simply use a bit of cold ash from the bottom of your fireplace and a paper towel to shine them.